Co. Galway: Annagh, Ballynakill, Caltra, Castleblakeney, Castleffrench, Clonbrock, Cloonkeen, Cooloo, Derryglassaun, Killeroran, Killian, Mountbellew, Mounthazel, Taghboy. The Guardians met each week on Tuesday. The new Mountbellew Union workhouse was erected on a six-acre site about a mile to the south-east of Mountbellew Bridge. Designed by the Poor Law Commissioners' architect George Wilkinson, the building was based on one of his standard plans to accommodate 500 inmates. Its construction cost £5,150 plus £920 for fittings etc. The workhouse location and layout are shown on the 1932 map below. 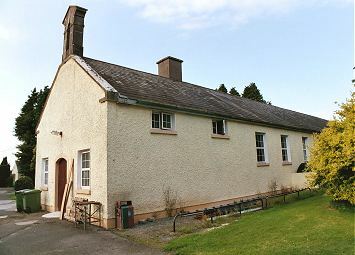 The design was somewhat different to Wilkinson's earlier plans, and was a similar size and layout to workhouses such as those at Glenamaddy and Portumna which were built at around the same time. The front of the site at the south-west had a gateway leading up a short driveway to an entrance archway. 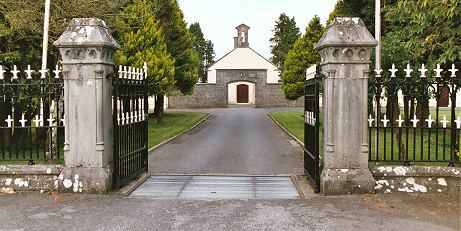 Mountbellew entrance from the south-west, 2003. At each side of the archway were long two-storey blocks containing school rooms and accommodation for boys and girls. Mountbellew children's blocks from the south, 2003. To the rear, the main buildings had a T-shaped layout. The central wing running towards the south-west was a single-storey block containing the dining-hall and kitchens. To each side were accommodation wings for men and one for women. A fever hospital and chapel lay at the north-east of the site, with a burial ground close by at the north. 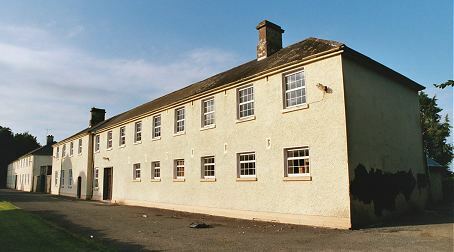 Mountbellew dining-hall/kitchen from the south, 2003. Mountbellew from the north, 2003. The site later became a Vocational and Technical College. The front and dining-hall/kitchen blocks still survive in the present college building. Galway local archives, Island House, Cathedral Square, Galway. Holdings include Board of Guardians' minutes (1850-1912).